We would be honoured if our clients, professional contacts, BOF members and friends would join us at 4:00pm on 5 December for the “Elevate CA Christmas Party – 2012”. If the idea of an accountant’s party leaves you searching for excuses like a long ago booked hair appointment, never fear – this one won’t fit the mold. For your entertainment, The Nukes >>> will be performing live. 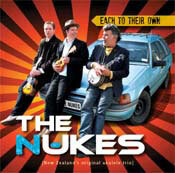 The Nukes are an ukelele trio with a twist: David Parker (Rhythm Cage, The Parker Project), Ben Collier (Goldenhorse, The Magnets) and David Thiele (or Snapper as they call him on stage), pumping out contemporary originals with killer harmonies. The Nukes have been touring New Zealand and Australia for the past two years – and have recently released their debut album “Each to their Own” – available on itunes. We will be serving the signature Elevate CA cocktail on the night. We can reveal it has generous helpings of lime, mint and satsuma in keeping with our colours – and some other rather tasty ingredients to give the event a little added zing. Of course as responsible hosts, we will also ply you with pizza and non-alcoholic beverages. Christmas festivities are from 4:00pm to 6:00pm on Wednesday 5 December – here in the Elevate CA office, level four, 35 Robert Street, Whangarei. We appreciate the massive support we have enjoyed from our clients and the business community during 2012 – and we would love to round off 2012 in style with you as our guest. Just e-mail Fraser (fraser@elevateCA.co.nz) before the end of Monday 3 December to RSVP – and we will look forward to seeing you there! i would love to come an celebrate with you . With no car transport in Auckland the only way is if you happen to know any friendly clients that might be coming from Auckland City to the party then i would be keen to pay petrol to come for the event. So have a wonderful party anyway if i am unable to come.